Often the foot contains accessory bones of which people may be unaware. These bones are often contained within the tendons and ligaments of the foot in areas of particularly high pressure. They are present only occasionally in any individual. Their function is much like the kneecap in the knee. They improve the leverage of the tendon, protect the joints, and keep the tendon from experiencing pressure concentrations that may eventually wear it out. 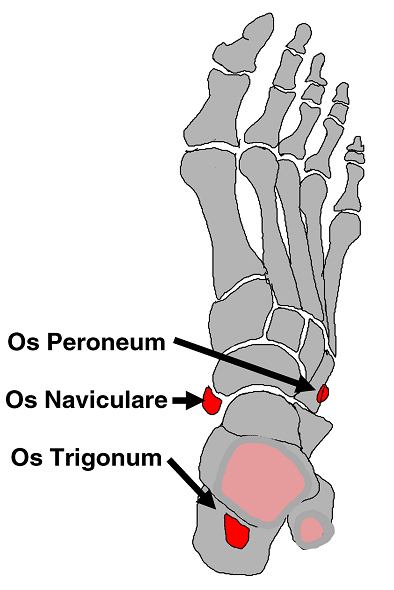 The most common of these bones are under the big toe (medial and lateral sesamoid), in the back of the ankle (ostrigonum), on the inside (osnaviculare) and outside (os perineum) of the midfoot. However, these bones are susceptible to their own set of problems. These bones typically form a joint with a larger nearby bone. This joint can develop arthritis especially after trauma. The bone can also loose its blood supply (avascular necrosis) or develop stress injuries and fractures. Finally, the fibrous unions that connect these bones to the larger nearby bones can become painful due to overuse or injury. Initially, rest and immobilization are used to treat these painful processes. In some cases, orthotic inserts can protect these bones. Bones in these areas can potentially cause pain. Most are seen in 10-30% of people. As a whole, the majority of people with these extra bones do not have any pain related to the presence of these bones. Surgical treatment of these painful problems can be considered when these measures are unsuccessful. The specific approach depends on the problem. It can vary from removal and repair of the surrounding structures to bone grafting with hardware to help it to heal. These problems can also be ignored if the pain and inconvenience is minor.